Staying Cooler with Metal Roofing? One common belief that has become more and more popular in recent years is that metal roofing can actually help make a home stay cooler during the warm weather months. However, is that really the case? Most homes that you see these days have asphalt shingle roofs, which are designed the way they are for a few reasons. First and foremost, this is the way we’ve been installing roofing for many years. Plus, as an added benefit, asphalt roofing is affordable and helps keep upfront costs more managable. However, the recent economy has shifted slightly in favor of materials that are more economical, both for the environment and in terms of long-term costs. While an asphalt shingle roof may be cheap for homeowners up front, the homeowner will still be facing the need to replace a roof in a shorter time frame than with a metal roof. While metal roofing requires a more expensive initial investment, homeowners may end up saving some money in the long term – both in the longer life span and even on energy costs. There are some mixed reviews of the efficacy of metal roofing versus traditional materials, but here are the main points to focus on: metal roofing is more durable than some other roofing materials, like asphalt shingles, and can therefore save homeowners money in terms of repairs. 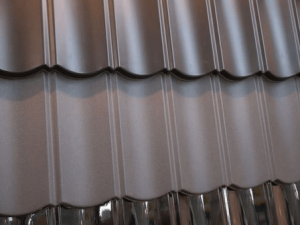 Metal roofing is also a bit more environmentally friendly, but the added benefits for keeping a roof cool all depends on the individual product’s cool-rating – regardless of metal or shingles. Asphalt shingles are still a common choice for those concerned about energy savings, and still provide a benefit for staying cool as they don’t absorb as much heat as other products. When it comes to heat absorption, though, the material is just as important as the actual product color, as darker materials will absorb more light and, in turn, more heat. As long as you choose a roofing material with a good cool-rating, you’ll be good to go. Here’s the final takeaway: metal roofing is a great option for homeowners who want a no-nonsense, no-fuss roofing solution that will last them longer than other materials, and may ultimately contribute to savings on their energy bills. But bear in mind that your roof’s ability to keep your home cool in hot months and warm in cold months depends not only on the material it’s made of or the color of the roof, but on the ventilation systems, proper sealing and many other factors. Contact Roofing by Bruce today for more information on metal roofing and roof ventilation systems.